Occasionally, everyone complains about night tennis. And I mean everyone. Players, fans, and media. If you say you’ve never whined about a late-night match, you’re a liar. But here’s the thing. Night tennis is completely, 100%, out-of-this-world MAGICAL. I rediscovered this last night. It was foolish that I had forgotten, but I was in a terrible mood, it had been a long week, and part of me just wanted to go home and either get caught up on all of the writing I was behind on or, you know, sleep. I know. I’m the worst. I was first drawn out of my all-work-no-play-hate-the-world cave by the cheers from the Keys/Niculescu cmatch. Madison had clawed her way into a third-set tiebreak on Court 1, one of the smallest courts in DC. The crowd from the next-door doubles match spilled over, creating a really awesome atmosphere. Considering it was night and everyone was done with work, out of the hot sun, and possibly with a beverage in their hand, it was a happy gang. and Madison was not a happy camper. Still, it was a phenomenal match for Keys, who showed the type of competitive don’t-give-up attitude that many Americans are missing. Plus, though the court was small, she came away with a lot of fans for life. I’m still on the bandwagon. I might be driving it. After that match finished, I wandered over to Grandstand to watch the end of the Mardy Fish/Radek Stepanek doubles match. Even though Fish lost in singles and pulled out of Montreal, doubles is still an integral part of his come-back plan. He has said in press that it’s all about getting used to situations that are out of his comfort zone, and night matches are a big hurdle to overcome, considering he has been keeping such a steady schedule due to his heart issues. Their entertaining match against Polish Power ended on a double fault in the super tiebreak. That’s never fun to see. Still, Team Ugly Shirt lived to play another day! Next, on a night-tennis high, I went over to see the end of the remaining doubles matches. 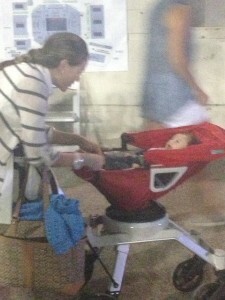 But first, I got distracted by some old-fashioned, super-creepy baby stalking. Look, if you’re not following Santiago Gonzalez on Instagram, you are missing out. Because, no offense to Micaela, but I’m pretty sure he has the CUTEST. Okay, I’m assuming you believe me now. 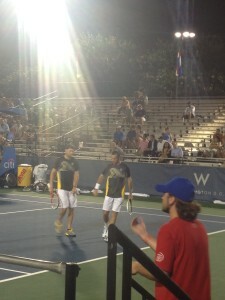 A few minutes after I arrived, Gonzalez and Lipsky sealed their 7-6(3), 6-3 win over Blake and Butorac. 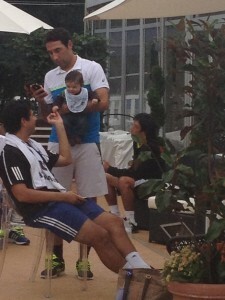 But Gonzalez didn’t come rushing out to greet his adorable family. Instead, he and Lipsky stayed on the same court to practice serving. I suppose that’s one perk of being the last match of the day. Nobody is going to rush you off of the court! 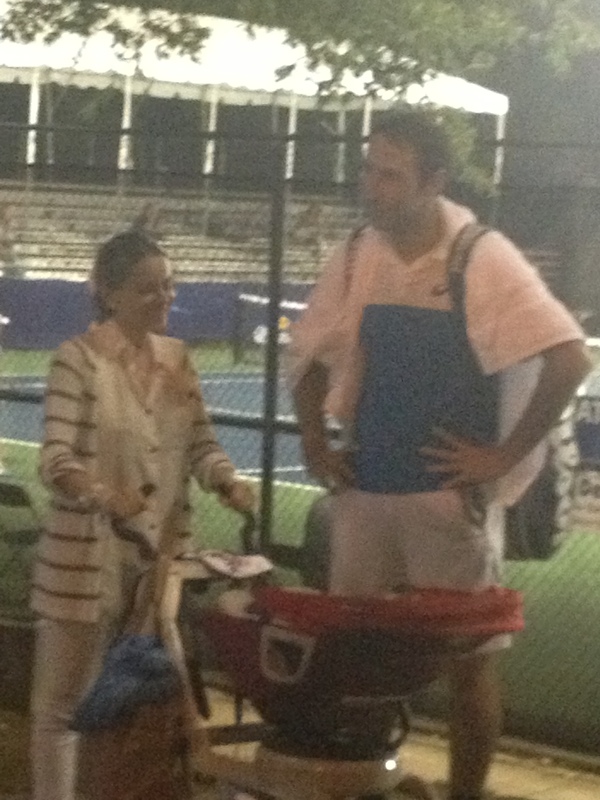 While Blake left the court quickly, Butorac stayed around for a bit to chat. I always love the camaraderie among the doubles players. However, I thought it must be pretty strange for Butorac to see the guys who just beat him go straight back to practice. But eventually, Gonzalez left the court and reunited with his family. Finally, I headed over to watch the last doubles match of the evening, Alexander Peya and Bruno Soares vs. Andre Begemann and Rohan Bopanna. I arrived just in time for the super tiebreak (again!) and it was a lot of fun. While it was on a small court, the special it’s-nighttime-and-nothing-else-is-happening-and-we’re-all-happy-to-be-here-watching-doubles atmosphere made it seem electric. In the super tiebreak, Peya twisted his ankle at the back of the court, and Bopanna was so concerned that it was adorable. Peya was able to continue, but Bopanna and Begemann won the match 10-5 in the STB. At the net, Bop talked with Peya for a while about the ankle. These are athletes, competing at the highest level of their sport, even though there’s not a giant crowd or a giant court or a giant check at the end of the match. This is what they work all year for. Titles like the Citi Open are up for grabs, and you can’t made it to the winner’s circle without tackling the first round. It means a lot, even if only to the four people on court in that moment. Seeing that up-close is always a treat. For me, a person with high-level ADD and a low-tolerance for brutal weather, tennis at night is a reprieve from the sunlight and the distractions, from the outside world that constantly tries to draw me away from this sport. Everything else is blacked out. It’s only what’s in front you that matters. That’s when the magic happens. And, sometimes it’s when the drunk and obnoxious happens. That’s pretty great too. There’s nothing as awesome as tennis under the lights. Please remind me next time I forget. And with that, I’m off to watch some more.